It was a wonderful Mother's Day here! A gorgeous day in Dallas! Blue skies and 70 degrees. Love it! Lilleigh was even found sporting this awesome shirt! Tonight Brendon grilled burgers while we sat out on the new patio. Lil loves to play outside, so it was awesome! After dinner, we went to a local ice cream place called Sweet Firefly. Can't say enough great things about it. Come to Richardson and check it out! And about the patio furniture... It was a Mother's Day gift. Sort-of. Our old furniture was falling apart, so our sweet friends the Widemans said we could have their old set which was in decent shape, since they has recently replaced it. Anyway that had been the plan. Brendon was going to make the effort to go get it for me, borrow a truck, etc, and get it all set up as my Mother's Day gift. But then I got a sweet deal from Kmart involving a free patio set. 20 lbs, which again is around the 20th percentile. Super talkative! 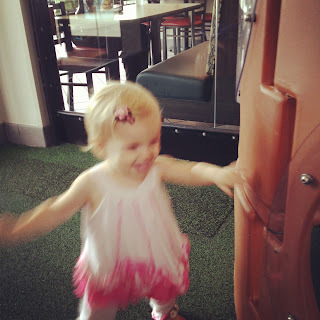 Her pediatrician actually said not to waste how verbal she is and to work on language with her. Attached to "Woof Woof!" She loves her lovey and carries him with her everywhere! I try to limit him leaving home though. Loves to play outside, riding in her wagon and playing in her sandbox and her water table! Says "noooo" and points whenever the chickens come near her. She was pecked once. Loves apples and calls them by name. They join her favorite foods of yogurt and banana. Has been weaned from the morning feed. One left, right before bed. She sleeps 7:30 pm to 7 am and then naps 1-4/4:30. I'm loving her new extended nap! And it's so fun to get out in the mornings with her! 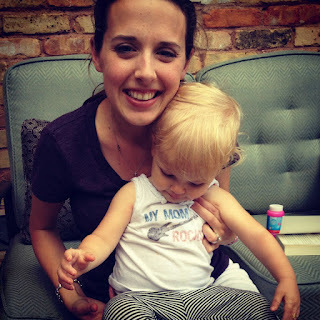 This post is mainly for my memory, so I'll be able to remember when I have future babies how things went down with weaning Lil. I've mentioned before that since Lil was 7 months old, she's been waking up at 5ish to nurse. I'm sure this was a case of what the Baby Whisperer would call "accidental parenting" because she slept a full 12 hours early on and then regressed. Still, I didn't complain because that early feed also meant she slept in till 8:30 or 9. Recently though I decided it was time to drop this feed. I mean really shes 15 months! A Recap of This Past Week! This past week Brendon was out of town, so Lil's Tita and Aunt Morgan came up to visit! 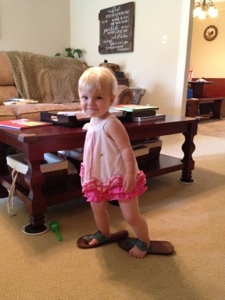 Lil was toddling around the house this week calling "Ta-ta, Mo-mo" - super cute! We had a great time with them! And this weekend we helped host a neighborhood block party for Cinco de Mayo! We are super involved in our neighborhood because we see our neighborhood as an outreach. We strongly feel that God has placed us where we are, so we want to take the opportunities He gives us to tell others about Him. Building relationships and forming a community is a great way to do that! Since Brendon has been traveling a lot lately, I have resubscribed to Netflix. And I've begun watching the Duggar family on 17 and Counting (aka 19 and Counting, but I'm on season 1). I had heard about this family, but since we don't have cable, I have not ever been able to watch it. 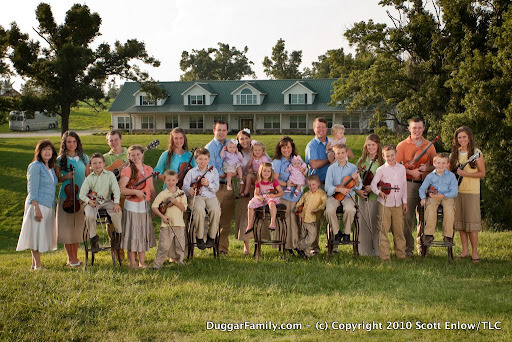 For anyone new to the game, the Duggars are the family with their own show on TLC because they have 17 (now, 19) kids and America seems to be enamored with that amount of children.